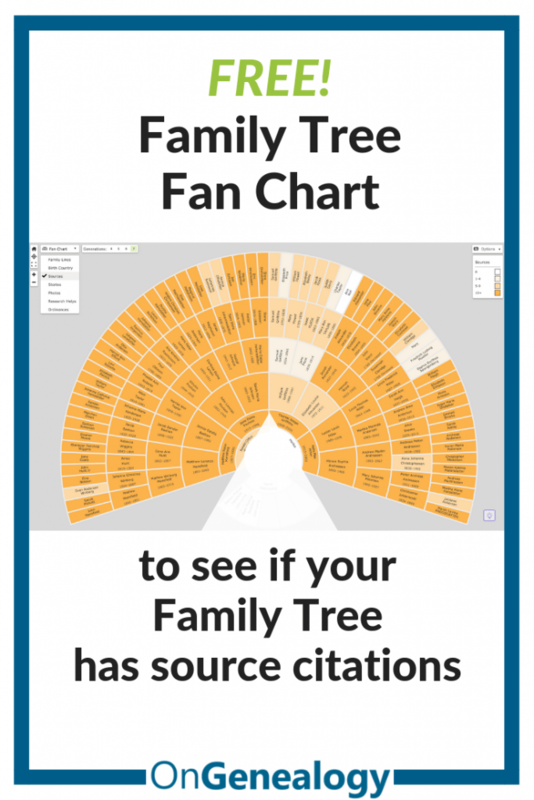 FamilySearch has a Fan Chart display mode you can use as a visual aid to see if your tree has source citations for each person. The tree is color-coded; the darker the color, the more source citations. 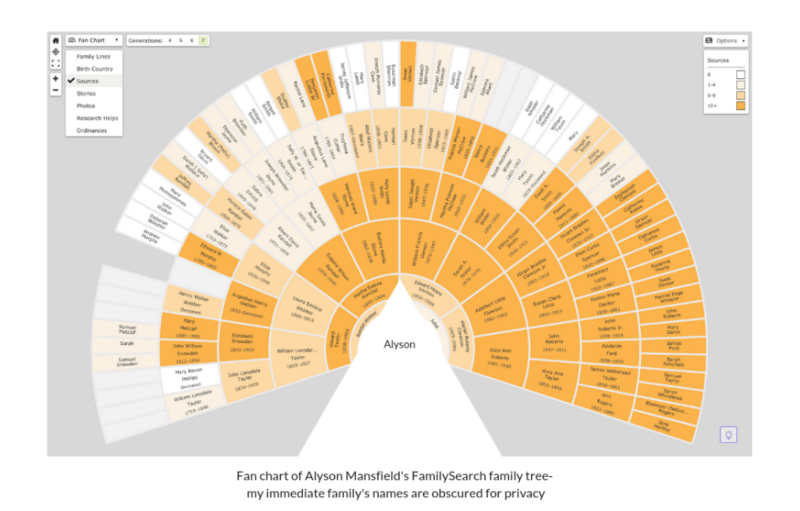 This is a great tool to help you see which family lines need more research and sourcing. FamilySearch family trees are community-owned trees that anyone can change. That makes one person’s research vulnerable to the human error of all others but can also make for a better-researched tree with multiple contributors. As you can see from his tree, most of his tree is well-sourced, with 10 or more sources per person. I guess you’d have to examine each source to argue the viability of the sources, but the general takeaway is people have taken time to source the names they add to this tree. The one family line where he has fewer sources has known illegitimacy and I’m not sure if they’ve struggled to source the adoptive parents or are trying to source the birth parents. You can see from the amount of white and lighter orange colors in my fan chart, my family tree needs better sourcing. The right side of my family tree with the darkest orange color (most sources) is the one polygamist line in my family. Part of the reason the right side of my tree is well-sourced is there are many, many descendants contributing to the genealogy research on this line. Their curiosity has bled over into some other lines going from right to left on my tree, but where they lose interest, I need to pick up the slack and start sourcing the genealogy. 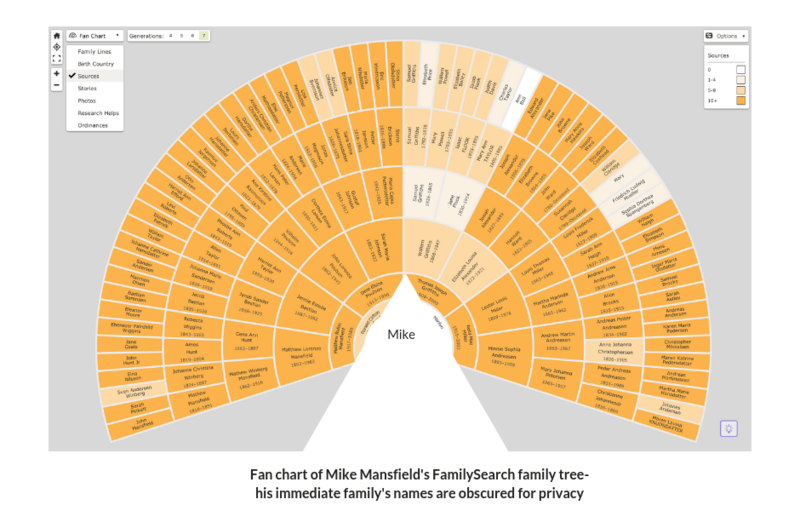 It’s worth noting that just because a tree doesn’t have tons of sources, doesn’t mean the names are speculative. It might just mean noone’s taken the time to accurately document the basic facts. I’ll spend the next few Sundays adding sources to my tree and see how much improvement I can make with a little effort. And I’ll post the results so you can see if I’ve improved my slovenly research habits. Step 6 – View your tree in Fan Chart mode. You can select any individual in this fan chart, go to their Person page, and look at the source citations or research suggestions. The Fan Chart Sources visual aid is a nice way to see the progression of your work and know which family lines need more effort. Best with your research! Here’s a pinnable image to save this How To for future reference! Please follow the OnGenealogy Pinterest boards for tips and research hints from genealogists and bloggers!